My trip to Burma (Myanmar) and Cambodia were really inspiring connecting with both my global human rights work, and my personal passion to find ways to address poverty issues under my FEEEDS Advocacy Initiative. One thing of note, poverty is poverty no matter where one finds it. There were so many similarities with my work in Africa under my FEEEDS Advocacy Initiative with what I saw and experienced in Myanmar and Cambodia. Below follows just a short sense of what I view both professionally and personal and impactful trip. 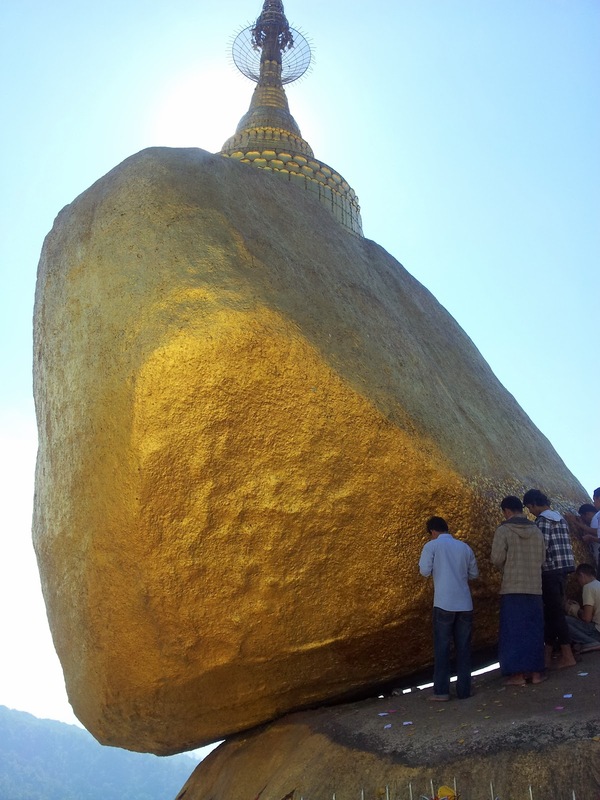 In Burma (official name is Myanmar), I traveled on my own 4 hours south to see one of the Buddhist pilgrimage sites called Golden Rock (left), 654 ton rock overlaid with 24ct gold which for millennia has rested on about a one foot square patch of mountain. A lock of Buddha’s hair is reportedly inside the rock. Challenge for me was walking barefoot 1/2 mile on hot stone as no shoes or sock are allowed on the trek up the path to the site. The following 7 days were Human Right Watch (HRW) Board member days. We had a series of meetings with: parliamentarians, human rights activists, journalists, and political prisoners who were blacklisted during the years Burma was closed until 2011 when it begin its transition from military rule. We also visited the old historical sites in downtown Rangoon (official name is Yangon), where the protest marches took place led by the Buddhists, which begin the political transition which we see today in Yangon 3 years after their protest. Many of our meetings were held in the capital Nyapyidaw (as the capital is not Rangoon/Yangon). We met with the country's President and Ministers of Defense, Information, Homeland, Religious Affairs, and Social Welfare as several foreign ambassador based in Myanmar to hear their views on the transition, and next steps. Our focus was on efforts to make the transition from military rule to democracy successful. We had discussions about the ethnic discrimination against the Rahinga. As HRW Board members we also went to the ancient city of Bagan and Inle Lake to ensure a better understanding of the history and culture of the country, as Bagan was the ancient capital, and at Inle Lake we experienced many of the traditional and artisan work of silk and lotus weavers, and the wonderful and unique lake-based farming methods and the delicate ecosystem managed by the lake villages where all the homes are on stilts.The unique lake farming done in Inle (floating plots of land growing veggies) is incredible and I plan to share with the African agriculture projects am working on as well. After my HRW meetings, went ahead to Cambodia as I wanted to better understand the history and the economic and political changes that had taken place there as well. I first landed in Seim Reap – which is an “all the way live little ancient city” ­- with midnight markets, and a Pub Street, in addition to be home to one of the seven wonders of the modern world -- the famous Angor Wat temple. Being in downtown Seim Reap was one of my surreal moments -- sitting on Pub Street in this old ancient city listening to Al Jarreau as I ate Cambodian curry. My other east-meets-west moment was taking a picture of a Buddhist monk with an iphone & camera- so much for piousness and austerity. Showing that despite the austere and piousness of this humble and respectful religious, technology can intrude. Is it a good thing or bad? Not sure. Also visited Ta Prohm temple (Tomb Raider was filmed there). All temples have Hindu & Buddhists influences. Loved watching the elephants coming through the ancient gates. At Lake “Tonle Sap,” it was sad to see 1270 poor boat villages in the middle of a lake. The average life expectancy for both men and women is only 54 years of age. The communities constantly have to move as the lake ebbs and flows as they seek to move where the lakes fauna move. I had the wonderful opportunity after leaving Tonle Sap to visit a quiet Buddhist monastery and watch a purification ceremony; a truly rare opportunity. I finished up my trip to Cambodia in the capital Phnom Penh – (Penh is name of a Lady who as legend has it pulled sand for the rivers that surround the city and created a hill, which now rests in the center of the city). Phnom is really a bustling city today despite the brutal Khmer Rouge years. Stayed in the historic Raffles where Jackie Kennedy stayed in 1967. en route to her Seim Reap visit to Angor Wat -- where I had just come from. In addition, I paid my respect at 2 genocide sites – one where nearly 40,000 people were killed, and 86 mass graves and more were found; one with 450 women and children. This particular "killing field" memorial includes a temple with glass walls, and 15 floors of skulls, bones, and clothes of the victims. The memorial design I thought was so powerful and unique as one doesn't enter the building but one looks up from the outside at each of the 4 sides of the glass-walled temple at 15 floors of human tragedy. One side had skulls lined up chin-to-nape about 2 ft deep; this was replicated on each side of the glass-walled temple, but with either other human bones, or victims clothing. I followed my visit by going to the prison where people were tortured before being sent to the “killing fields.” This is my second time to a genocide site as I have been to Rwanda when I was on former President Clinton’s NSC staff. Always saddens me the extent of man’s inhumanity to man. I also visited the Palace in Phnom Penh, and went to convergence of the Upper and Lower Mekong rivers just a few miles off the river shore line that highlights the city to watch the sun set over the palace to top off my stay. In both Phnom and Seim Reap I went to the Artisan Angor workshop and store because it is a training cooperative for at-risk communities and the disabled. I am such a believer in these types of income generating programs to help at-risk communities. I have worked on many programs like this throughout my previous career, and try to support them under FEEEDS. In this case, these at-risk groups learned traditional skills such as silver-lattice work, teak, rosewood, and rubber tree carving, and the famous lacquer techniques which all were the traditional skill sets of the ancient Siam Kingdoms from which today's Cambodia hails. There was one moment in Seim Reap at the Artisan workshop where the guide interpreter for my tour, translated something a hear-impaired young women who was during intricate word work of ancient signs and symbols, was trying to convey to me as she had not seen an African-American women before or certainly one with dreads. She signed that she liked both my hair and skin color. On the way back to the U.S., I stopped in Seoul Korea. I happen to be in Seoul when South and North Korea holding a family reunification ceremony, which had been done in over three years as North Korea had refused. I saw the Palace, and the old South Gate of the city, visited the famous market food street, where Secretary Kerry had been days before, and went to the top of the city's largest building, called the N-Tower (whenever there is a unique tallest building opportunity -- I am there!) where one gets to overlook the entire city. The N-Tower site is also where the old city wall can be seen. There are two traditions to do at the N-Tower - if you are there with a boyfriend or spouse, there is a practice of buying a padlock and place it closed on a branch outside of the tower; the second tradition is done at the top of the tower where one buys a small tile and writes a message of love to whomever. My little blue tile now rest on the wall with others in tribute to family and friends.